3:49 Yoga and trauma came together as more was known about trauma. Bessel van der Kolk who did a small study of yoga and PTSD. He is a strong voice, and the trauma community recognized the body’s role in trauma healing. Allows a safe and structured way for body to feel again. PTSD as a diagnosis occurred in the 1980’s Society has realized that everyone has experienced trauma in their lifetime. Can react to trauma in present moment situations that not helpful to situation. 6:38 Research has focussed and supported yoga as a helpful modality for trauma. Research studies for PTSD have had encouraging results – lots of feasibility studies. Demand for yoga for trauma courses are very strong. Heather’s popular yoga for trauma course attracts psychiatrists, psychologists, psychotherapists, and yoga teachers. More and more course applications are from the medical community. 9:12 Yoga teachers should know about trauma. Recently published a book (Yoga for Mental Health by Kelly Birch and Heather Mason) where chapters are written by experts in their field. A chapter about trauma focused yoga therapy by Daniel Libby and Dana Moore is provides a good information on this topic. Yoga teachers dealing with students who are experiencing PTSD should be careful of language during class. The student’s experience may not be positive either mentally, physically or emotionally. Don’t tell people what they are likely to feel. PTSD is likely to make people feel disembodied. Better to give them a cue with a focal point (e.g., you may feel tension in your hamstrings at the back of the legs in a forward bend). Touch should be approved by the student at all times. Movement to make yoga trauma-sensitive but yoga can be so much more than that because of its effect on the autonomic nervous system. 13:05 Yoga Training for Trauma: when dealing with PTSD understanding what people are presenting with (it can be variable) – more difficult if have a group class. Restorative allows people to deeply rest but some may some may feel vulnerable. Moving can be empowering. Every style of yoga can be appropriate for people with PTSD; depends on the stage they are in, what’s going on and their proclivities. All teachers need to understand how to handle triggering. Can’t stop anyone from triggering. All yoga teacher training courses should have a mental health component because yoga classes have a higher percentage of people attending with mental health issues than the population average. Teach yoga teaches to handle general mental health issues and triggering. 22:50 Where will trauma and yoga be in 10 years? Yoga will be more and more integrated into the mental health system (in UK). Difference between health care systems in different countries makes it difficult to predict and will manifest differently. In UK – trauma-based treatments with yoga components are now included in their national health care system (NHS). Yoga teachers will be increasingly aware of value of yoga for mental health issues and best practices. More research in this area. Flourishing of classes for those with mental health issues. Yoga community should offer yoga saying it is for depression anxiety, PTSD, trauma. People are desperate for help. The stigma of mental health illness is decreasing now and will continue to do so. Online technologies allow people to access yoga in their homes. 27:00 Integrated into the system in UK; how can we get into the health care systems in all countries. Where health care is paid for by the government, it is easy as only have to convince one entity while a system of 100’s of insurance companies is much harder to enter. Governments want low-cost, effective and efficient modalities for their health care systems. UK and India are making great progress, most successful countries will export their systems to others. Countries like the US where individuals pay for their health care will be interesting. But Medicare does pay for the Dean Ornish treatment which includes yoga. Either UK, India or Sweden may be the model for the rest of the world. 29:30 Parliamentary Group – Yoga in Society. Heather is the Secretary of the Group and it has four pillars. Yoga in: a) education, b) criminal justice system, c) health care, and d) occupational health. Different groups are working in all four areas. 3:10 Offers trainings that are usually the result of people having taken her training and then asking her to give a training in their country. Special Yoga develops training for each country based on what is needed. Very flexible/adaptable in length of time and type of training given. Each person leaves the training with yoga tools to either help children with a broad range of needs or specific tools for specific needs. Can be a yoga teacher, paediatric professional, teacher, parent or ? Jyoti’s organisation works with schools, governments, non-profits, etc. 5:45 Offerings can be simplified but are very powerful so need a background in yoga. There are lots of access points to bring yoga to those who need it. Everyone finishing the course/workshop will have a tool box of appropriate yoga tools to help the children. 7 day workshop teaches a wide variety of tools for a wide variety of needs while shorter ones target specific tools for the participants. Example: breath can be accessed through your own breathing, movement, sound, massage points, touch. 8:22 Training includes breathing, movement, relaxation. Yoga is the philosophy of being and this is the beginning point of all trainings. The 1st thing is how do you meet the needs of child and your needs. How do we connect? Our state of mind matters. Start all of the trainings by learning to meet the child in a loving, open way. 10:08 Jyoti used yoga tools to help a severely disabled child while he slept. He woke up happier and his mother said his body felt different . Jyoti has no idea of why it worked but intuitively it seemed the right thjng to do. She knows that Yoga tools work but not exactly why they work. She is humble and grateful to do this work. 13:05 1st world workshops on a commercial basis, while 3rd world workshops are usually sponsored by governments, non-profits, schools, orphanages working together. Again the workshops are not targeted to a particular practitioner but to anyone that wishes to do this work. 16:10 7 day workshop in Sydney, 12-18 January 2019. !st time this workshop will be offered in Australia. People will leave the workshop empowered and inspired and will have tools to meet the needs of children. Will have tools and processes for children with a wide variety of needs. Practical and experiential practices. 17:40 Jyoti took her first yoga class in 1974 and realised that this was showing her a path for her life. She eventually opened a yoga studio in London and people with disabilities and children started coming to her classes. 22:20 Jyoti’s mission is to reach as many children as possible. The trainings provide a group of people with yoga tools to reach children all over the world. 7 day workshop for yoga professionals, paediatric professionals, parents, teachers, or anyone interested. Next year she will have trainings in London, Ireland, Spain, maybe Mexico, Brazil. Enquiries from: South Africa, Finland. 4:50 He developed an Adaptive Yoga Manual for yoga teachers. It is available on his website (www.access2yoga.com) for everyone. He teaches Adaptive Yoga workshops and contributed a chapter to Yoga and Body Image (2015) that tells the stories of 25 yogis who don’t look like the public perception of yoga. 6:30 In the last 10 years, adaptive, accessible yoga had become mainstream due to the efforts of Mathew Sanford and Jivana Heyman. They are talking and writing about making yoga more accessible. More teachers are becoming interested in accessible yoga as more demographics learn the about the benefits of yoga and want to participate. 1 in 5 people have a disability and others have injuries that need modifications, others are curvy and all may need some modifications. 10:00 Teachers in workshops need to know that yoga can be inclusive. Can adapt poses and still receive benefits. For instance Tadasana (mountain) pose can be done in a chair and the upper body receives the same benefits as if the pose was done standing. 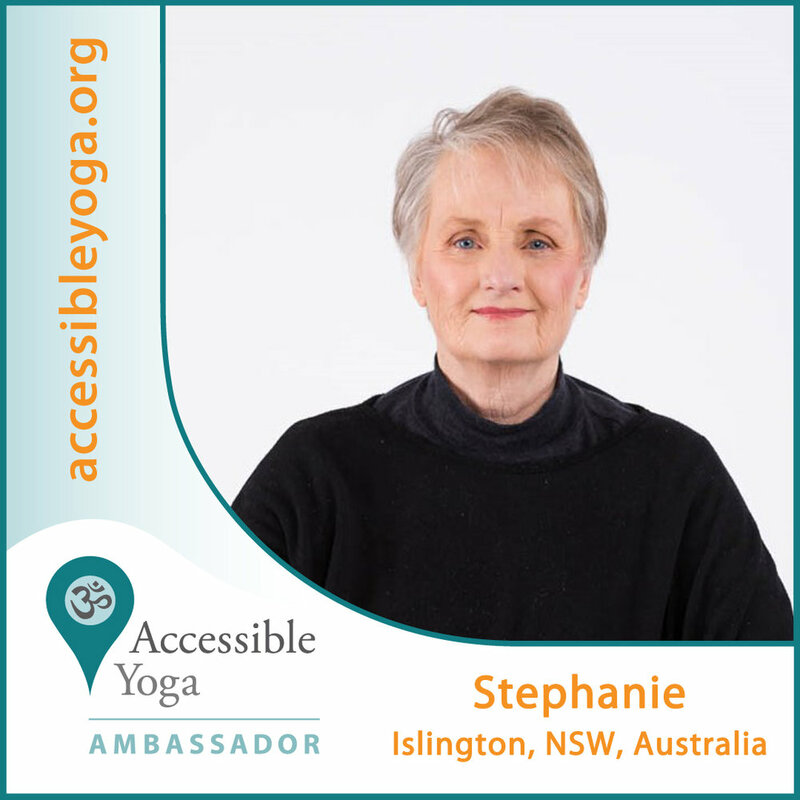 13:25 The accessible yoga ambassadors program came from the Accessible yoga concept to make yoga inclusive. Ambassadors work to make the public aware that yoga can be inclusive. A recent review by Yoga Alliance included people from Accessible Yoga. Ryan was on the Teacher Qualifications workgroup and he hopes that accessible yoga ideas are included in teacher training requirements as a result of this review. 16:34 Three things that a yoga teacher should do to make sure his/her class is inclusive? c) Offer modifications if they are struggling. Most importantly make them feel safe and welcome in class. 3:29 Slow Postpartum is the time after the birth of the baby and the women in taken care of by her community. Time is 30-40 days of complete rest and care: support, nourishment, and time to heal and bond with the baby. Quite common in several cultures around the world. When a women has a baby, the brain recalibrates and parts of the brain start interacting for the first time as the women becomes a mother. This transformation needs time, care, nourishment, healing, and making connection with the baby. Matriescence = moving from being a woman to being a mother. 8:00 Jojo teaches yoga classes to pregnant women. Yoga is helpful during the birth, and postpartum can also be helped by yoga but in a different form. 9:30 Pregnant and postpartum body are very different. Many new pregnant students coming to a yoga class are beginners. They have relaxin hormone in their bodies which loosens muscles, tendons, ligaments. Have to be careful not to push into the joints, hyperextension. Postpartum body is different: will still have relaxin for weeks or months. Body is very open from giving birth; the pelvic floor muscles have been greatly stretched. Body is open: physically, mentally and spiritually. Can’t do poses that they did before pregnancy for weeks or months. Need a teacher that understands the postpartum body. 13:49 Postpartum mums and bubs classes: very common for someone to be crying either babies or mums. Jojo recommends that they don’t come for at least 6 weeks. Mums are very sleep deprived, hormonal, anxious. The class is for the women; body needs caring, nourishing and yoga can be beneficial. They are told to make the class what they need it to be. Social interaction with other new mums is very important. 17:30 Helpful poses and contraindicated poses during this period. Women may have C-section scars, and/or separation of the rectus abdominus. So very slowly, methodically strengthen the abdominal muscles and pelvic floor. Contraindicated poses include twists, especially deep seated twists and plank because they destabilise the core. Remain careful about pushing into the joints. Poses should close the pelvic area, not stretch it. Shoulder stretches are very helpful because of always holding the baby. Babies naturally do yoga as they stretch and move their bodies. 21:00 Jojo does offer her postpartum doula clients training in meditation. Women in the postpartum class are told to do savasana in any position that they want. They are to come into the present and just be with their baby. 23:08 Body in postpartum needs care, nourishing and support. Find a teacher that is familiar with the postpartum body’s needs. Shouldn’t return to pregnancy, gym or regular yoga classes as they are not suitable for the postpartum body. Your baby is your yoga at this time. Motherhood is a deeply spiritual practice, you learn patience, accept how things are instead of how you want them to be, unlimited and unconditional love. 26:15 Returning to regular classes is very individualised. High impact classes not before 6 months, regular classes not for 12 weeks. Listen to your body. 2:32 Yogahood started as a result of the founder’s experience of yoga’s benefits. Janaki is involved because of her psychology training and family interest in yoga. Janaki is a clinical psychologist working primarily with youth with mental health issues and knows the benefits for this population. 4:70 Yogahood is a not for profit organisation, that has partnerships with community organisations and also yoga studios and yoga brands. Community organisations have been approaching Yogahood to bring their classes to the community’s space. Yoga studios and yoga brands can help fund in many ways Yogahood’s activities. Yogahood’s volunteers go to the community sites to offer the classes. 8:00 Volunteer teachers must have 200 hour teacher training and 50 hours of teaching experience to take the 3 day Yogahood outreach training. The class settings are very basic with just mats and some space; learning how to navigate a very different environment in which to give a class is one aspect of the training. The emphasis of the classes is to give people tools to take home and help them cope in their lives. Disadvantaged communities often have no opportunity to access yoga because of financial hardship. 12:45 Benefits to Students: Overall research shows many benefits of yoga. For youth with mental health issues, research indicates that yoga is helpful in stress, depression, etc. Yoga develops the pre-frontal cortex which is where planning, decision making and self-management occurs. This helps in dealing with stressors. Cognitive benefits include improving memory. 16:00 Young people, through yoga, are taught to tune in to their body and choose what they want to do that day according to how their body feels. They learn that is ok to listen to my body and do what it needs and then feel great when I do that. 17:30 Yogahood collects feedback and evaluates their program. Anecdotally, they hear that yoga helps participants manage their stress and better self-regulation among other improvements. 19:00 Yogahood’s training does provide some basic information on what teacher’s might expect when dealing with a wide range of participants with very different needs but can’t provide in depth. Each community organisation provides a person to be in the room during class. The volunteer is only responsible for teaching the class; the community person takes care of any issues that may arise. This is best for the teacher, the organisation and the participants. At the beginning of class, participants are told that the community person is there and if they have some issues to talk to that person. 21:25 Although Yogahood does provide some basic training in the issues that might occur, they also provide mentoring/pairing of a new volunteer with an experienced volunteer. They will teach the class together for a few classes so the new volunteer can receive feedback and get comfortable with his/her role. 23:25 Yogahood’s goals for the future are to provide the service to as many community organisations as possible given resources. It’s mission is to provide yoga to people who have needs for yoga’s tools. Talk therapy has limitations for some clients. It does not encourage thinking about one’s own body to help with the healing. Research on trauma-based yoga shows that trauma basically sticks people in the trauma situation and they keep reliving it. Perceiving everything as a threat and living in the past and can’t physically let go of the trauma. Talk therapy may have them move mentally beyond the trauma but something has have help them move physically beyond the trauma.. They must ground themselves in the present which yoga does very well. Yoga increases the links between body, mind, breath. Yogahood is offering outreach training for new volunteers in early December. 31:45 Yogahood asks the volunteers to go into the community and work with people with high needs. Can be quite daunting for a volunteer. Yogahood offers wellness sessions for the volunteers to help them with their self-care and to maintain a balance in their lives. The wellness sessions may be a restorative yoga class, yin yoga, sound healing, massages. Consent: There is culture around touch in yoga. Many people don’t want to be touched. Only uses touch in cases of safety or to point out certain things the student may not understand. How to ensure a consent mindset is to set a focus that the student and teacher are working together but student controls what the body does. Touch is not optional; students are the experts concerning their bodies. Each pose is an enquiry about your own body and you have agency about what your body will do. Models of Consent: must an enthusiastic yes, consent cards, students understand what adjustment means and how it might be done, students have the right during any part of class to refuse touch. Amber is interested in any other techniques from the listeners about how they handle consent. 14:20 Agency – Amber has practiced yoga in a fat body for 15 years. Originally, she couldn’t find a teacher to modify her poses to accommodate her body. She had to create her own practice to make it work for the body she had. Loved the benefits of yoga so she figured out a lot on her own. Large-bodied individuals, disabled students need modifications. Not here to fix someone or someone’s body, we are offering tools to empower students to do yoga. We need to learn how to teach others since we were trained to teach other yoga teachers in our teacher training. If the student leaves with a successful experience, then they will probably return. 22:10 Tips for studio owners, teachers to make the space inclusive. Is it physically accessible for people disabled or elderly or injured? Is it financially accessible? Do you offer scholarship opportunities or subsidised rates? Letting others who can afford to pay above the rate to help those who cannot pay. Do you have diverse teachers? Are students going to see someone like them? What kind of photographs do you use in your marketing? Yoga language or? What is the purpose of the Asana? Can you duplicate that purpose with modifications, props or other asanas if the first asana is not appropriate? 30:45 How did yoga help Amber make peace with her body? Recommended by her physical trainer to do yoga on the off days since it would burn calories but wasn’t considered exercise. Went to her first class and she was the only bigger bodied person. She attended the class and left when it was over and noticed that the negative self-talk started which meant that at some period before it had stopped. She felt so good afterwards that she returned to class. Yoga made a huge difference in her emotional state. Found a teacher who could help. She had been fighting against her body, but yoga gave her the tools to partner with her body and accept her body. 38:38 Body Positive Movement – get to a place of acceptance and peace with the body. Free of emotional energy in not fighting the boy. Yoga is the best tool for self-regulation. Opportunity: Hersha Yoga is offering an online course to expand your knowledge of teaching pregnant women with medical issues. To explore the course: http://bit.ly/HERSHA If you choose to take the course, use this code CFOYHERSHA to receive 15% off. This is a limited offer with set amount of places available at this reduced rate. 3:24 Changing the message of what yoga is and can be. Yoga is accessible. Jivana became involved with accessible yoga as an AIDS activist and teaching yoga to those with Aids and other disabilities. Yoga helped with the sadness and sorrow of losing so many friends for both Jivana and his students. He was inspired by students with disabilities. Even though they be sick and dying, they were learning through yoga to cultivate peace of mind. 7:18 Gym yoga was increasing in numbers and in the process becoming less inclusive. Jivana trained teachers over 20 years but students with disabilities wouldn’t consider taking teacher training. In many cases it was too difficult because of short time periods, etc. People with disabilities did not have the opportunity to participate in the depth of learning/understanding of philosophical and other aspects of yoga that occur in a teacher training course. 9:45 Wanted to connect the physical with the philosophical aspects of yoga. 10:15 Trained with Integral Yoga which is a classical yoga lineage developed by Satchidananda. It includes clear and understandable teachings in yoga philosophy. 11:38 Jivana wanted to add a clear community component to Accessible yoga. Developed conferences and the ambassador program; both of which concentrate on building community and providing support to teachers who are teaching special populations. Conferences also provides a platform for marketing the teacher’s skills that may be more authentic than the business model of marketing. 15:51 Currently there are 600 ambassadors = a free program to support yoga teachers who teach underserved populations. There are several FB groups based on geography and language to support each other. 17:54 Jivana did develop a teacher training for people with disabilities. It was a year long and provided individual support. Now Accessible Yoga’s teacher training now helps yoga teachers to learn how to adapt for people with disabilities. How to teach a class that has people at multiple levels of wellness. It is basically a skill-building course. 24:25 To become an Accessible Yoga Ambassador, (although Accessible Yoga’s Ambassador program is changing shortly –details on the website) complete the application form and just have to explain how you are bringing yoga to underserved populations. 26:10 Jivana has emphasised the community aspect to get beyond the competition driven by the business model. He believes the only way to be successful is to collaborate with other teachers. 28:06 The Accessible Yoga conferences are opportunity for the community building component of Accessible Yoga. It is a gift to support each other. Approximately ¼ attend on a scholarship. Conferences planned: October – Germany, May 2019 – St Louis. 15% on the course code: CFOYHERSHA. Limited offer. 3:20 “ We are not meant to be the same size all of our life.” Beth was a fitness instructor – helped people lose weight. She had eating disorders – anorexic, orthorexic. Helped women restrict their food, which leads to restrictions in your entire life. If we are restricting in any area of our life, then we are restricting our whole life. What happens when we change the mindset from diet culture – massive amount of unravelling of beliefs. Start to reframe your thoughts, reframe your beliefs, can take years. 6:55 Started eating in an intuitive way. Listen to the cues of the body, understanding what those mean, so eating when you are hungry, understanding your body’s hunger and fullness cues. All foods are equal, any food is OK at any time. Tune in to the body, honor those cues. Yoga is very helpful because it focuses on paying attention to physical cues and sensations. Meditation provides focus for internal dialogues. Gives you a practice to start listening to the body. 9:30 Thinking about your weight and what you are supposed to eat or not takes up a tremendous amount of mental time. “Your life’s purpose is not a weight loss project” – using the weight loss project as a way to not deal with other areas of your life. We have all been carrying around a 20 lb rock and when we put it down, we can do other things. 12:20 The perception of yoga supports the “diet culture” – the young, slim, yoga body. This perception is a big obstacle but there is a group of rebels who are pushing that yoga is for everybody. Beth lives her life and her practice to model and authentic and honest yogi life. There is more than one way to be (a yogi). Thai Yoga: assisted stretching. Client is totally passive, Beth provides a facilitated meditation with assisted stretching, rhythmic movements, pressure in soft tissues. Client gets into his/her body in a different way. People who don’t pay attention to their body, gets them into their body. Ayurvedic Face Lift and Thai Reflexology: great ways to start for those with trauma. Both are very restricted in the areas that are touched so there is certainty about where they will be touched by someone else. 1 A get to know you call and see if Beth is the appropriate person for this person’s needs – can refer to others. Beth envisions the overall structure concerning the sessions but the client directs. Where the body takes us, where the beliefs takes us. Using movement, journaling, meditation, art. Online can see each other so can do asanas remotely. Beth has cultivated a network of colleagues that she can refer the client to for face-to face work. 22:50 Diet culture – we have lost the ability to understand and notice our body’s cues. Cannot feel for ourselves. Works on more love for ourselves and our body. Work on interoception and pay attention to your body. Many believe that yoga should not be modified for men; yoga is for all. But men and women have different social conditioning, motivations, physical and muscular differences. 9:20 Yoga conversations are demonising physical aspects of yoga and yet this is the way many men start. They are at the beginning more interested in the physical aspects, especially how this can help them with injuries, stress and other athletic endeavours. About half the men start yoga by coming with a friend, usually female. It helps to get over the barriers invisible to women but obvious to men in a yoga class. Meet each student where they are at, assuring them that being uncomfortable at the beginning is natural. Tell them the tangible outcomes of a yoga practice. Enhances awareness of the body and emotional state. 18:35 Missy explains why she is adding touch to her list of skills as she takes training in massage therapy. Touch is quite controversial currently with many men being accused of inappropriate touch. Men can be quite confused about what is ok and what is not. There is a lot of fear and shame around touch for men. So may tend to not touch in any situation. Touch helps them with their evolving yoga practice. Touch can also be a trigger for trauma, so permission is always asked for and only given with permission. Teaching about boundaries with asking for permission to touch. 29:00 Attracting men to yoga classes and as yoga therapy clients. You teach men differently. Have them opt-in to the process: this is what I see, here is the process with explanation based on evidence based principles, here are the goals you told me you want to achieve. Functional mobility is of most value to men at the beginning and should be where the emphasis should be placed initially. When they see the value, they often become yoga practitioners for life. 33:30 Missy has launched an online course on to develop and maintain a home practice. And also offers a free 30 minute mobility assessment. More information is on her website. Opportunity: If you are interested in learning about or expanding your knowledge about teaching accessible yoga to pregnant women, Hersha Yoga has introduced online training in this subject. www.hershayoga.com is the website. Clicking on this link: http://bit.ly/HERSHA will bring you to the page for the accessible yoga for pregnant women and you can also pay for the course. If you add the code CTOFYHERSHA in the box for codes you will receive 15% off. This is a limited offer. Working with other professionals to meet the needs of the whole person. Collaborate with the family to help special needs children. Works with different challenges –physical, developmental, and mental challenges of children from toddlers to over 18. May introduce the same material e.g. super heroes but at different developmental levels. 15:30 Collaborate with family and other professionals. Team approach; incorporates yoga concepts to meet the goals for the child set by other professionals. 18:30 Benefits to students include better understanding of proprioception, and helps with social engagement. Accessible yoga for pregnancy, for differently abled children and adults, and training to become a yoga teacher for those with different abilities. 3:25 Research on how yoga affects young people: Hippocampus .eu Working the with the European Union and includes asylum seekers. Training those who work with young people like social workers, psychologists, teachers. Just started working with refugees in Italy. Syrians are open to yoga while Muslims from Africa can be concerned about religious issues. 6:20 Charlotta works with women in the UAE and has designed some yoga classes sensitive to Islam. The women in the UAE have said that their yoga practice brings them closer to their religion, single gender classes, allow them to express how yoga might challenge or support their religion. 9:42 Pressures and stresses of being a teenager today. 1 in5 14-17 year olds have a diagnosable mental health issue. Suicide is the largest cause of death for males under 21. Social media is impacting health – constantly having to present yourself in a certain way while having a strong desire to belong. Acutely aware of suffering across the globe which can be difficult for young people. 13:40 Yoga’s benefits for young people: their greatest fear is being alone and not belonging. Yoga allows you to be alone with others. Moving, breathing, together but being in your own body. 16:11 Charlotta’s book: “Teen Yoga” a practical handbook on how we can help young people physically, mentally, spiritually (available in August 2018) . Audience for the book is professionals who use yoga as therapy within their professions. But is also good for parents. 18:15 Teen Yoga Foundation - became a charity in 2016. Charlotta started teaching yoga in schools and because of the need, started training others to teach teen yoga. Invited to bring her teach in orphanages in Sierra Leone for children that had been traumatized. Invited to Kashmir. Will be working in Johannesburg in the townships. All of these places are hoping that yoga will cultivate inner peace which will then lead to outer peace and stop the fighting that these different countries have experienced. 28:15 Have just launched the beta version of a yoga app for teenagers. Allows them to do yoga without having to go to classes. It should be available in 2019. Anyone wanting to know more about the foundation, especially young people, can contact Charlotta through her website. They always need more resources: people, money, assistance. Book: “Teen Yoga” – Amazon – available August, 2018. 2:35 Yoga for Amputees – classes, yoga teacher training for teaching amputees. The basis of the classes and training is: every person is whole. Amputees may not feel whole physically, emotionally or mentally. Maybe stared at often. Takes effort everyday. Need resilience. 7:37 Marsha’s journey: starting teaching classes for “normal” people but attracted students with challenges. Students started asking for her help for their family, friends. Started teaching yoga for kids with challenges. Offered classes for veterans and gave workshops on that topic. The workshops grew into training because of the demand. 16:00 How to make an amputee feel comfortable in class Teach to capabilities and the highest possibilities. Your belief in their ability to do yoga will make them believe it also. Amputees are inventive and creative, since they will be faced with new situations every day and have to figure out how to adjust. Don’t put hands on the prosthesis. Amputees practice mindfulness daily as they must be very aware of the situation and how their body will react. 23:02 Teacher training for teaching amputees. On-line course for trainees worldwide. With online weekly classes, trainees have more time to absorb the information. For teachers that may need help with a student with an amputation, Marsha provides consultations to develop the teacher’s expertise in providing yoga for that student. 25:57 “From the Roots: Marsha’s book about her journey. Includes poetry, stories, essays on how to live with long-term illness. Can be ordered from Amazon. Everyone should live daily at their highest essence and create daily. 2:20 Corporate Yoga – started as part of wellbeing programs in work place. Caroline was contacted to provide yoga classes and meditation courses. Some corporations are committed to their staff’s wellbeing but less common in last few years. Benefits to students and to the organisation. Company benefits include increasing profits through employee retention and improved employee output. Need a champion to talk to senior management about implementing the program and can also help with logistics. Co-contribution by staff reinforce commitment to attend. 10:20 Corporate classes: Caroline teaches them so that the postures, breathing and relaxation can be replicated in their offices, at home or while travelling. Teaches what the poses do – i.e., opening hips. All classes include work on the mat, standing, and in a chair. Pranyama and meditation. 13:00 Meditation – changed Caroline’s life. Due to health issues, wanted to improve her health and immune system. Asked Craig Hassad (a colleague) for information but he just told her to start meditating. Just 5 minutes to start and tell him how it was. Using meditation assisted in bringing her white blood cell count from zero to near normal. This led to completing teacher training and creating her own yoga studio. Realised climbing the corporate ladder wasn’t very fulfilling. She is now calmer, sleeps better, her problem-solving is better. 23:00 She has created a Japanese garden around her studio to create stillness and serenity. 25:18 Caroline’s study of yoga therapy and Ayurveda led her to realise that these two can help individuals with their issues. Hopes it will become an integral part of the health system. 3:00 Preventing disease through yoga and other healthy lifestyles. Explore different healing themes in Andrea's yoga classes. Observation in Andrea's interactive class as the student's are taught how to practice their yoga at home. Teach them to explore a ujique healthy lifestyle that meets their needs. Uses svasana as a way for the class's movements and breath to sink into the body to remember better what occurred. 7:48 Andrea starts with a lesson plan based on current research into the best yoga practices for health. She participates on FB groups looking at the nexus of yoga and health to keep her knowledge fresh. 10:20 Proper nutrition can improve chronic conditions. Although some improvements may be seen with an improved meals for Alzheimer's patients, developing meals with few carbohydrates and sugars will help the children of these patients. Current research considers Alzheimer's a form of diabetes - essentially diabetes of the brain. Without the ability to make insulin work properly (and unable to process carbs and sugars well), the brain is starved for energy. 19:00 Yoga teacher's become a source of information for their students and must have significant knowledge in the areas they teach. No 21 year old can understand the needs or goals of a 59 year old in a yoga class. Their bodies are too different. 24:45 Heart of a yogi; every teacher should have the heart of a yogi. Yoga is a practice for life; everything that happens on the mat will translate into useful information in the rest of life. Marcie Leek teaches students with cancer and their caregivers, people grieving, large-bodied women and knitters. She modifies her classes for each of the populations using the tenets of viniyoga. She has classes in the Seattle, USA area, on line courses and a workshop for women grieving for their mothers. Join us as Marcie explains how she meets the needs of these diverse students. 1:20 Introduction - Marcie Leek teaches students with cancer and their caregivers, people grieving, large-bodied women and knitters. 7:40 Teaches a diversity of student populations who are in pain physically, mentally, emotionally or spirtually. Using the tenets of viniyoga but modifying for the special needs of each population. She researches needs of each group and then modifies her poses, breathing, meditation to meet those needs within the viniyoga tradition. 21:20 Marcie and Paige Tangney are offering a workshop in Seattle Washington, USA for daughters grieving their mothers in February and May. Paige a certified therapist will be using the tools of therapy while Marcie offers yoga techniques. 25:15 Marcie has on line course for large bodied women, developing a course on grieving and will have some youtube videos for knitters in the near future. 20:30 Free 8 week sessions around Sydney with instructional videos in Tamil, Arabic, and Nepali for students’ personal practice. 23:15 Students’ descriptions of the benefits of yoga classes. Decrease in anger and chronic pain. 1:00 Introduction: Aerobatics, Zen of Las Vegas, volunteering, Patti's travels. 9:20 Benefits for Clients: Breathing, meditation, relax, focus and movement. 18:58 - Reiki is energy work and unblocks energy channels. Clients of the center can attend reiki circles after leaving the facility. A reiki circle is a group where facilitators provide energy release for the attendees. 24:15 - Patti has combined all of these modalities to help others. She has utilised all of these modalities to build a coaching system: Live Balanced Naturally. Patti coaches women who are at a crossroads of their life to find the best exercise, to eat cleanly, and to find a spiritual path that is good for them.